Dorothy Thompson, the daughter of Peter Thompson, a Methodist preacher, was born in Lancaster, New York, on 9th July, 1893. According to her biographer, Marion K. Sanders, when Dorothy was eight her mother died from blood poisoning after a bungled abortion performed by Dorothy's maternal grandmother." 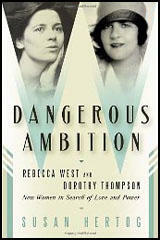 Dorothy rebelled after her mother's death and her father's remarriage and she was sent to Chicago to live with her aunt. While studying politics and economics at Syracuse University she became a suffragist and was involved in the campaign to obtain the vote for women. After the First World War Thompson went to Europe to become a freelance writer. In 1920 she persuaded the International News Service to let her cover a Zionist conference in Vienna. This work resulted in her being employed as a European correspondent for the Philadelphia Public Ledger. Later she acquired a similar post with the New York Post and in 1925 she was appointed as head of its Berlin bureau in Germany. During this period she became friends with Raymond Gram Swing and John Gunther while working in Germany. Ken Cuthbertson, the author of Inside: The Biography of John Gunther (1992), has pointed out: "Thompson, who was taken with John Gunther, befriended him both as a young man and a pupil. Theirs was an intimate, albeit platonic (as far as is known), relationship which endured through good times and bad." When she moved to Moscow in 1926 she became friends with fellow journalists, Hubert Knickerbocker, Walter Duranty, Louis Fischer, Vincent Sheean and William Henry Chamberlin. According to Sally J. Taylor, the author of Stalin's Apologist: Walter Duranty (1990): "Her presence in Moscow was the occasion for a good deal of socializing, which included meeting other reporters in the Soviet capital." Thompson met Sinclair Lewis at one of Duranty's parties. Taylor points out: "Lewis and his wife were the guests of honor at a dinner given at Duranty's apartment. Always known for his outrageous behaviour. Lewis discoursed wisely on this occasion, did a brilliant reading of his own work, and then, dead drunk, fell asleep on Duranty's couch. Finally, not knowing what else to do, everybody just went home. Duranty always held it against Lewis, believing that Lewis had behaved deplorably." Thompson met Lewis again in Berlin in June, 1927, when she went to tea with Gustav Stresemann. The following month she invited Lewis to her thirty-fourth birthday party. Susan Hertog, the author of Dangerous Ambition (2011) has pointed out: "Lewis, newly arrived from Paris, was in the midst of a drunken sprawl through Europe in search of distraction and oblivion. His wife, Grace Hegger, was in love with another man, and his newly published novel, Elmer Gantry, an expose of orgiastic moral corroption among the clergy, had been targeted by the church... It wasn't Lewis's literary reputation that intrigued Dorothy, although that might have sufficed; it was his ineffable sadness, and what she would call the Christ-like weight of his visceral suffering." 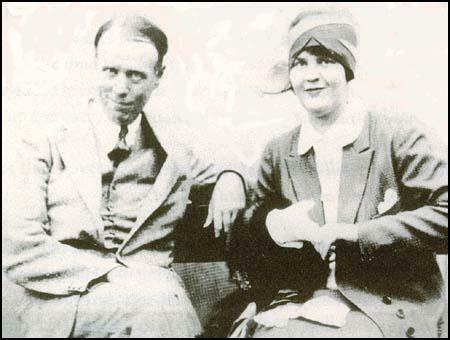 Sinclair Lewis and Dorothy Thompson in 1928. On 14th May 1928 Thompson married Sinclair Lewis. After interviewing Adolf Hitler in 1931 she wrote about the dangers of him winning power in Germany. A strong opponent of Hitler and his government, in 1934 Thompson became the first American correspondent to be expelled from Nazi Germany. A fellow journalist, Raymond Gram Swing, compared her writing with Freda Kirchwey: "I wish to say that she (Kirchwey) was one of the best and most likable journalists with whom I ever worked. I am tempted to call her the best woman journalist I ever encountered, but hesitate to rank her ahead of Dorothy Thompson, who was a better writer." On her return to the United States Thompson joined the New York Tribune and in 1936 began writing a newspaper column, On the Record . The following year she began broadcasting for the NBC. Thompson also wrote for the Ladies' Home Journal and developed such a large following that Time Magazine called her the second most popular woman in America, after Eleanor Roosevelt. Books by Thompson included New Russia, (1928), I Saw Hitler! (1932), Anarchy or Organization (1938) and Let the Record Speak (1939). 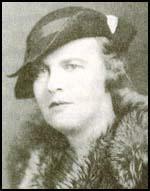 Jennet Conant, the author of The Irregulars: Roald Dahl and the British Spy Ring in Wartime Washington (2008) argues that Ernest Cuneo, who worked for British Security Coordination, was "empowered to feed select British intelligence items about Nazi sympathizers and subversives" to friendly journalists such as Thompson, Walter Winchell, Drew Pearson, Walter Lippmann, Raymond Gram Swing, Edward Murrow, Vincent Sheean, Eric Sevareid, Edmond Taylor, Rex Stout, Edgar Ansel Mowrer and Whitelaw Reid, who "were stealth operatives in their campaign against Britain's enemies in America". Thomas E. Mahl, the author of Desperate Deception: British Covert Operations in the United States, 1939-44 (1998) has argued: "During this period... Dorothy Thompson exhibited an amazing to reflect the British propaganda line of the day. This is one of the few useful conclusions to be gained from reading the hundreds of pages in her FBI file. 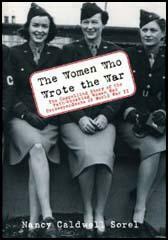 Thompson's diary, kept for only a dozen entries in early 1942, also illustrates her close ties to the intelligence community." Thompson lost her job with the New York Tribune after endorsing Franklin D. Roosevelt for a third term in 1944. She published The Courage to be Happy in 1957. Dorothy Thompson died in Lisbon, Portugal, on 30th January, 1961. A week ago today an anaemic-looking boy with brooding black eyes walked quietly into the German embassy in the rue de Lille in Paris, asked to see the ambassador, was shown into the office of the third secretary, Herr von Rath, and shot him. Herr von Rath died on Wednesday. I want to talk about that boy I feel as though I knew him, for in the past five years I have met so many whose story is the same - the same except for this unique desperate act. Herschel Grynzspan was one of the hundreds of thousands of refugees whom the terror east of the Rhine has turned loose in the world. His permit to stay in Paris had expired. He could not leave France, for no country would take him in. He could not work because no country would give him a work permit. So he moved about, hoping he would not be picked up and deported, only to be deported again, and yet again. Sometimes he found a bed with another refugee. Sometimes he huddled away from the wind under the bridges of the Seine. He got letters from his father, who was in Hanover, in Germany. His father was all right. He still had a little tailoring shop and managed honorably to earn enough for food and shelter. Maybe he would have sent his son money, but he was not allowed to send any out of Germany. Herschel read the newspapers, and all that he could read filled him with dark anxiety and wild despair. He read how men, women and children, driven out of the Sudentenland by a conquering army - conquering with the consent of Great Britain and France - had been forced to cross the border into Czechoslovakia on their hands and knees - and then had been ordered out of that dismembered country, that, shorn of her richest lands and factories, did not know how to feed the mouths that were left. He read that Jewish children had been stood on platforms in front of classes of German children and had had their features pointed to and described by the teacher as marks of a criminal race. He read that men and women of his race, amongst them scholars and a general decorated for his bravery had been forced to wash the streets, while the mob laughed. There were men of his race, whom he had been taught to venerate - scientists and educators and scholars who once had been honored by their country. He read that they had been driven from their posts. He heard that the Nazi government had started all this because they said the Jews had made them lose the World War. But Herschel had not even been born when the World War ended. He was seventeen years old. Herschel had a pistol. I don't know why he had it. Maybe he had bought it somewhere thinking to use it on himself, if the worst came to the worst. Thousands of men and women of his race had killed themselves in the last years, rather than live like hunted animals. Still, he lived on. Then, a few days ago, he got a letter from his father. His father told him that he had been summoned from his bed, and herded with thousands of others into a train of box cars, and shipped over the border, into Poland. He had not been allowed to take any of his meager savings with him. Just fifty cents. "I am penniless," he wrote to his son. This was the end. Herschel fingered his pistol and thought: "Why doesn't someone do something! Why must we be chased around the earth like animals!" Herschel was wrong. Animals are not chased around the world like this. In every country there are societies for the prevention of cruelty to animals. But there are none for the prevention of cruelty to people. Herschel thought of the people responsible for this terror. Right in Paris were some, who were the official representatives of these responsible people. Maybe he thought that assassination is an honorable profession in these days. He knew, no doubt, that the youths who murdered the Austrian Chancellor Dollfuss are heroes in Nazi Germany, as are the murderers of Rathenau. Maybe he remembered that only four years ago the Nazi Leader himself had caused scores of men to be assassinated without a trial, and had justified it simply by saying that he was the law. And so Herschel walked into the German embassy and shot Herr von Rath. Herschel made no attempt to escape. Escape was out of the question anyhow.